It seems that Golden Ticket has all the features a good slot needs. First of all, it has really simple rules - you just collect the matching icons. Also, there are only few special symbols to pay attention to! Secondly, the design of the slot is pretty stylish. And, finally, the slot features a bonus round which could bring you some nice winnings. 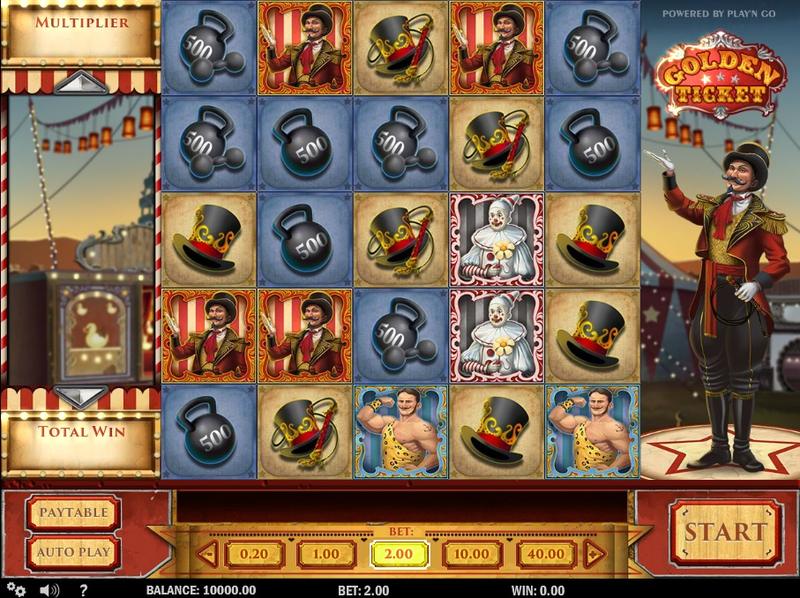 Golden Ticket slot was developed by Play’n Go. It has 5 reels and 5 lines. Frankly speaking, the name of this slot doesn’t really correspond to its design - the game looks like a travelling circus. Strange, but anyway, the design is cool and creative. An icon with the words “Golden Ticket” is the wild symbol. And that’s it, scatter symbols are not welcome in the circus. The whole idea of Golden Ticket Slot is to create vertical or horizontal lines of matching symbols. And when you manage to collect 3 or more identical icons in a row, one of them gets replaced by the Wild symbol. Yeah, since there are no Scatters in this game, the Golden Ticket symbol can substitute for anything. And, obviously, the Wild icon can contribute to new winning combinations while the symbols cascade. Moreover, the multiplier is increased with each successive win - you can see it on the left side of the paytable. When new wins are impossible, you go to the next spin. And here is one more important thing to know - the bonus round. To launch it, you need to clear the bonus column. Sounds logical. So, every spin a huge word “Bonus” appears on 2 random columns behind the symbols. Just clear one of them, and the bonus round will be triggered. When it happens, the main screen turns into a shooting gallery. To win, you need to collect 5 or more identical symbols. “And remember, you can receive additional spins in case you get 5 or more bonus stars”. This icon looks like a star with the word “Bonus”, so you won’t miss it. Actually, Golden Ticket Slot is a nice way to spend your time. Yeah, it offers no progressive jackpot, but it has a cool design, and you will have no problems with understanding its rules. Everything is really simple here. And, what is also nice, the bonus round is not too difficult to reach. Click here to visit the circus.